Citation Information: J Clin Invest. 2004;113(7):933-933. https://doi.org/10.1172/JCI119996. Citation Information: J Clin Invest. 2004;113(7):934-934. https://doi.org/10.1172/JCI21507. Citation Information: J Clin Invest. 2004;113(7):935-935. https://doi.org/10.1172/JCI21490. Citation Information: J Clin Invest. 2004;113(7):952-954. https://doi.org/10.1172/JCI21412. The factors that contribute to the development of B cell chronic lymphocytic leukemia (B-CLL) are unknown, and the groups of individuals at the greatest risk for developing this common leukemia are not well defined. Molecular features are important for classifying cases of B-CLL, and it is now apparent that similarities among Ig rearrangements between patients may give important clues to the origin of this disease. Citation Information: J Clin Invest. 2004;113(7):955-957. https://doi.org/10.1172/JCI21388. Previous animal studies have demonstrated that the loss of the β1 subunit of the large-conductance Ca2+-activated K+ (BK) channel leads to hypertension. A new study demonstrates that a gain in β1 subunit function is associated with protection against diastolic hypertension in humans, underscoring the importance of the β1 subunit and the BK channel in the regulation of vascular resistance. Citation Information: J Clin Invest. 2004;113(7):957-959. https://doi.org/10.1172/JCI21402. Failure in the peristaltic mechanism that conducts urine from the kidney to the bladder can lead to hydronephrosis, a common birth defect associated with obstructive nephropathy. New animal models reveal molecular pathways important for peristalsis and point to the central role of the renal pelvis in urine transport. Citation Information: J Clin Invest. 2004;113(7):960-962. https://doi.org/10.1172/JCI21478. Several Bcl-2 family members, including Bim, may contribute to programmed cell death by inducing mitochondrial cytochrome c release, which activates caspase-9 and then caspase-3, the “executioner” of the cell. In this issue of the JCI, Shinoda and collaborators show the key role of Bim in epileptic seizure–induced neuronal injury and identify the contribution of transcription factors responsible for seizure-induced Bim upregulation . Citation Information: J Clin Invest. 2004;113(7):963-972. https://doi.org/10.1172/JCI20515. Regulatory T (TR) cells consist of phenotypically and functionally distinct CD4+ and CD8+ T cell subsets engaged both in maintaining self-tolerance and in preventing anti–non-self effector responses (microbial, tumor, transplant, and so on) that may be harmful to the host. Here we propose that the proinflammatory function of virus-specific memory effector CCR7–CD8+ T cells, which are massively recruited in the liver, are inefficient (in terms of IFN-γ production) in patients with chronic hepatitis C virus (HCV) infection because of the concomitant presence of virus-specific CCR7–CD8+ TR cells producing considerable amounts of IL-10. These CD8+ TR cells are antigen specific, as they can be stimulated by HCV epitopes and suppress T cell responses that are in turn restored by the addition of neutralizing anti–IL-10. 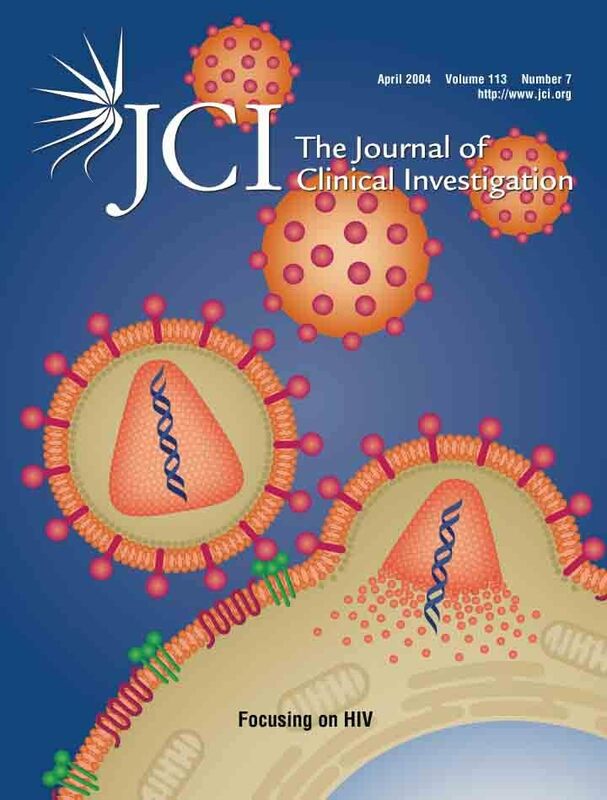 This study provides for the first time to our knowledge direct evidence of the existence of virus-specific CD8+ TR cells that infiltrate the livers of patients with chronic HCV infection, identifies IL-10 as a soluble inhibitory factor mediating suppression, and suggests that these cells play a pivotal role in controlling hepatic effector CD8+ T cell responses. Citation Information: J Clin Invest. 2004;113(7):990-997. https://doi.org/10.1172/JCI19388. We describe the generation of mice that express a transgenic T cell receptor (TCR) (5B6) specific for the encephalitogenic myelin proteolipid protein (PLP) peptide 139–151, on the experimental autoimmune encephalomyelitis–resistant (EAE-resistant) B10.S background. Despite harboring a high frequency of self-reactive T cells, 5B6 transgenic mice on the B10.S background rarely develop spontaneous EAE, which is in striking contrast to 5B6 transgenic mice on the EAE-susceptible SJL background. The relative resistance to spontaneous EAE in transgenic B10.S mice is not due to deletion or anergy of T cells, but appears to be controlled by APCs. Analysis of APCs revealed a lower activation state and a lower T cell–activating capacity for APCs from B10.S mice than for those from EAE-susceptible SJL mice. When APCs in 5B6 transgenic B10.S mice were activated, for example, via TLR9 or TLR4, T cell tolerance was broken, resulting in EAE. Our findings demonstrate that activation of APCs via innate immune receptors can break self tolerance and trigger the development of autoimmunity even in a genetically resistant strain. These findings suggest that the development of autoimmune diseases such as multiple sclerosis is determined at least partly by the endogenous activation state of APCs. Citation Information: J Clin Invest. 2004;113(7):1008-1016. https://doi.org/10.1172/JCI19399. Studies of B cell antigen receptors (BCRs) expressed by leukemic lymphocytes from patients with B cell chronic lymphocytic leukemia (B-CLL) suggest that B lymphocytes with some level of BCR structural restriction become transformed. While analyzing rearranged VHDJH and VLJL genes of 25 non–IgM-producing B-CLL cases, we found five IgG+ cases that display strikingly similar BCRs (use of the same H- and L-chain V gene segments with unique, shared heavy chain third complementarity-determining region [HCDR3] and light chain third complementarity-determining region [LCDR3] motifs). These H- and L-chain characteristics were not identified in other B-CLL cases or in normal B lymphocytes whose sequences are available in the public databases. Three-dimensional modeling studies suggest that these BCRs could bind the same antigenic epitope. The structural features of the B-CLL BCRs resemble those of mAb’s reactive with carbohydrate determinants of bacterial capsules or viral coats and with certain autoantigens. These findings suggest that the B lymphocytes that gave rise to these IgG+ B-CLL cells were selected for this unique BCR structure. This selection could have occurred because the precursors of the B-CLL cells were chosen for their antigen-binding capabilities by antigen(s) of restricted nature and structure, or because the precursors derived from a B cell subpopulation with limited BCR heterogeneity, or both. Citation Information: J Clin Invest. 2004;113(7):1017-1024. https://doi.org/10.1172/JCI20007. A major drawback of current approaches to antiangiogenic gene therapy is the lack of tissue-specific targeting. The aim of this work was to trigger endothelial cell–specific apoptosis, using adenoviral vector–mediated delivery of a chimeric death receptor derived from the modified endothelium-specific pre-proendothelin-1 (PPE-1) promoter. In the present study, we constructed an adenovirus-based vector that targets tumor angiogenesis. Transcriptional control was achieved by use of a modified endothelium-specific promoter. Expression of a chimeric death receptor, composed of Fas and TNF receptor 1, resulted in specific apoptosis of endothelial cells in vitro and sensitization of cells to the proapoptotic effect of TNF-α. The antitumoral activity of the vectors was assayed in two mouse models. In the model of B16 melanoma, a single systemic injection of virus to the tail vein caused growth retardation of tumor and reduction of tumor mass with central tumor necrosis. When the Lewis lung carcinoma lung-metastasis model was applied, i.v. injection of vector resulted in reduction of lung-metastasis mass, via an antiangiogenic mechanism. Moreover, by application of the PPE-1–based transcriptional control, a humoral immune response against the transgene was avoided. Collectively, these data provide evidence that transcriptionally controlled, angiogenesis-targeted gene therapy is feasible. Citation Information: J Clin Invest. 2004;113(7):1025-1031. https://doi.org/10.1172/JCI20106. Hemophilia is a bleeding disorder caused by mutations in the genes encoding coagulation Factor VIII (FVIII) or FIX. Current treatment is through intravenous infusion of the missing protein. The major complication of treatment is the development of neutralizing Ab’s to the clotting factor. Infusion of recombinant activated human Factor VII (rhFVIIa), driving procoagulant reactions independently of human FVIII (hFVIII) or hFIX, has been successful in such patients and could in theory provide hemostasis in all hemophilia patients. However, its high cost and short half-life have limited its use. Here, we report a novel treatment strategy with a recombinant adeno-associated virus vector delivering a modified FVII transgene that can be intracellularly processed and secreted as activated FVII (FVIIa). We show long-term expression, as well as phenotypic correction of hemophilia B mice following gene transfer of the murine FVIIa homolog, with no evidence of thrombotic complications at these doses. These data hold promise for a potential treatment for hemophilia and other bleeding disorders. Citation Information: J Clin Invest. 2004;113(7):1032-1039. https://doi.org/10.1172/JCI20347. Hypertension is the most prevalent risk factor for cardiovascular diseases, present in almost 30% of adults. A key element in the control of vascular tone is the large-conductance, Ca2+-dependent K+ (BK) channel. The BK channel in vascular smooth muscle is formed by an ion-conducting α subunit and a regulatory β1 subunit, which couples local increases in intracellular Ca2+ to augmented channel activity and vascular relaxation. Our large population-based genetic epidemiological study has identified a new single-nucleotide substitution (G352A) in the β1 gene (KCNMB1), corresponding to an E65K mutation in the protein. This mutation results in a gain of function of the channel and is associated with low prevalence of moderate and severe diastolic hypertension. BK-β1E65K channels showed increased Ca2+ sensitivity, compared with wild-type channels, without changes in channel kinetics. In conclusion, the BK-β1E65K channel might offer a more efficient negative-feedback effect on vascular smooth muscle contractility, consistent with a protective effect of the K allele against the severity of diastolic hypertension. Citation Information: J Clin Invest. 2004;113(7):1051-1058. https://doi.org/10.1172/JCI20049. Congenital obstructive nephropathy is the principal cause of renal failure in infants and children. The underlying molecular and cellular mechanisms of this disease, however, remain largely undetermined. We generated a mouse model of congenital obstructive nephropathy that resembles ureteropelvic junction obstruction in humans. In these mice, calcineurin function is removed by the selective deletion of Cnb1 in the mesenchyme of the developing urinary tract using the Cre/lox system. This deletion results in reduced proliferation in the smooth muscle cells and other mesenchymal cells in the developing urinary tract. Compromised cell proliferation causes abnormal development of the renal pelvis and ureter, leading to defective pyeloureteral peristalsis, progressive renal obstruction, and, eventually, fatal renal failure. Our study demonstrates that calcineurin is an essential signaling molecule in urinary tract development and is required for normal proliferation of the urinary tract mesenchymal cells in a cell-autonomous manner. These studies also emphasize the importance of functional obstruction, resulting from developmental abnormality, in causing congenital obstructive nephropathy. Citation Information: J Clin Invest. 2004;113(7):1069-1069. https://doi.org/10.1172/JCI18025E1. Citation Information: J Clin Invest. 2004;113(7):1070-1070. https://doi.org/10.1172/JCI21060E1. Citation Information: J Clin Invest. 2004;113(7):1070-1070. https://doi.org/10.1172/JCI21357E1.